Dual Concrete Handicap Fountain | Petersen Mfg. 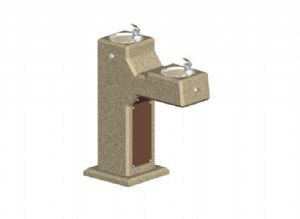 Co. Inc.
DFH Dual drinking fountain is available with an optional side faucet and is built to meet or exceed industry standards. The dual water fountain is a handicap accessible fountain and is used by state and federal government agencies, fast food restaurants, department stores, educational facilities, parks & recreation departments and residential complexes. For more Details, CAD Drawings and Specifications Please Log-in or Register above. 33" x 40" x 17"
Dimensions 33" x 40" x 17"
Colors will vary slightly on the internet compared to actual product. Samples are available upon request. Concrete Stain available on Smooth Surfaces. Custom Colors and Textures available upon request.